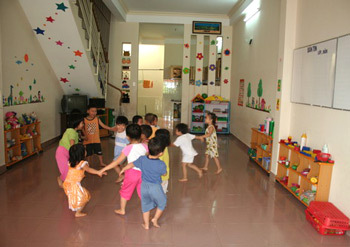 HA NOI (VNS)— Authorities say they are unable to act against thousands of illegal private kindergartens and daycare centres in the country because the latter help fill the wide gap that exists between demand and supply. A seminar held by the Ministry of Education and Training in Ha Noi last Thursday heard that there are around 5,600 private nurseries working illegally in 50 provinces and cities nationwide. In the northern port city of Hai Phong, 560 of more than 900 private nurseries are unlicensed, said Truong Thi Phuong Dung of the city's Department of Education and Training. She said that the illegal institutions do not meet the Government's childcare and education standards and most of them have substandard facilities, including infrastructure. For instance, classrooms are too small and kitchens are unhygienic, she said, adding that many babysitters at illegal daycare centres are elderly or unemployed women not trained to provide quality care. "Kids are unsafe there," Dung said. Officials from Bac Ninh said at the seminar that there were over 1,300 nursery teachers and babysitters working for illegal kindergartens and daycare centres in the northern province, but just 14 per cent have qualifications satisfying Government standards. The rest are students of universities and colleges, or those attending short-term training courses, they said. Despite these problems, it is difficult to take action against the illegal childcare providers because of the huge shortage of such facilities in the country, said Ngo Thi Minh, vice chairman of the National Assembly's Committee for Culture, Education, Youth and Children. Minh said State-owned and licensed private kindergartens and daycare centres can only take care of 23 per cent of children under three. Even in Ha Noi, where the establishment of kindergartens has been paid a lot of attention, the rate is just 29.5 per cent, she added. "What about the right to go to shool of the remaining 70 per cent of our children? If unlicensed kindergartens and daycare centres are forced to stop operations, where can the children be when their parents go to work?"